There’s a new option available to countertop buyers. It’s a manufactured stone product made to be installed on top of existing laminate or tile countertops. The question is; how does it compare in value to traditional countertop offerings? The overlay “granite” product is a man-made mixture of granite, quartz, and other stone particles mixed with resins to form a ¼” thick slab. It is not granite in its natural state. This is essentially the same as traditional Quartz products like Silestone, Caesarstone, and Cambria except it is not as thick. It certainly does when it comes to the appearance of the finished product. Traditional stone products are 1-1/2” thick throughout. 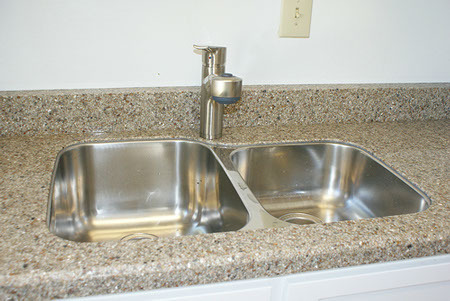 Since most people opt for an under-mounted sink the thickness of the material is very evident. Reviews of the ¼” overlay products have indicated the thin material looks cheap. Silestone offers ¼” thick slabs but only recommends them for tile or vertical surfaces. Thickness also plays a role in durability. Since the stone overlay products are relatively new it is too early to say how well they will hold up over time. Some buyers have indicated on HGTV Forums that the product has not held up well over time. Other overlay products have been available in the past; none of them are still around today. Traditional products like Granite, Quartz, and Solid Surface have been proven to truly last a lifetime. How do these products compare as to versatility of design? The most versatile product by far is Solid Surface (i.e. Corian, LG HiMacs, etc.). Solid Surface is acrylic and polyester blends. It can formed into organic shapes (thermoforming) and polished to a variety of gloss levels. Edge profiles are limited only by your imagination. It is also the only product that offers “integrated” sinks eliminating the silicone around the sink making them more hygienic and easy to clean. Traditional stone products like Granite and Quartz also offer a staggering range of colors, edge options, and even a few different finishes on the surface. The most common finish is glossy; however, “leather” (matte) finishes are becoming more popular. 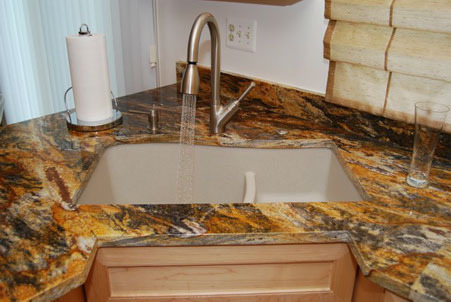 Some stone countertop manufacturers are also capable of applying a variety of other finishes to the surface of stone. The stone overlay product offers fewer color and texture options. Edge options are also limited due to the thickness of the material. These products are only available with one type of gloss finish. What about the cost of removing old countertops? Generally removing old countertops is a quick and painless process. A reputable countertop company will clean up any mess created from a removal. Typically removals take about 30 minutes for laminate and about 2 hours for tile. Cost of removal varies depending upon what kind of countertops you have. Some companies may even remove your old countertops for free. How do they compare in cost? This will vary depending upon many factors. In general, the stone overlay products are comparable in price to common granite, quartz, and solid surface products. Exotic granites and the “designer” colors of quartz and solid surface will be more expensive.